My M type is chassis no. 716. I bought it November 2005. 35 years ago I had another M type, chassis no. 823 reg. no. JC 9688 which won many concours awards. I sold it to finance a business venture and often regretted it even though the business venture was successful. My old carhas beenregularly rallied by its present owners, John and Kate Manley-Tucker including the Alpine and the Paris-Peking. When I bought MUA 630 I decided to make it even better so I stripped it right down to the chassis and rebuilt it with several improvements and a hot engine. One of the big problems with the M bodyis the rather flimsy "B" post. They tend to become very strained over years of abuse and the doors sag and the body flexes so I designed a reinforcing bracket which is quite discrete andhas improved rigidity in that area. It's got a "new" French engine that was stripped down and rebuilt with an Isky hot road cam. Offenhauser alloy cylinder heads, a pair of new Stromberg 97s on an Offenhauser dual inlet manifold.Side change transmission rebuilt with Lincoln Zephyr gears and the back axle ratio changed from 4.1 to 3.54. Generator (dynamo in UK speak) replaced by Speedmaster's alternator/ generator lookalike for improved lighting etc. The starter was also replaced with a high torque unit. An aluminum radiator was fitted along with water pumps from Speedwell's improved cooling significantly. I have been amazed at how much more stuff is available nowadays for classic cars in general. 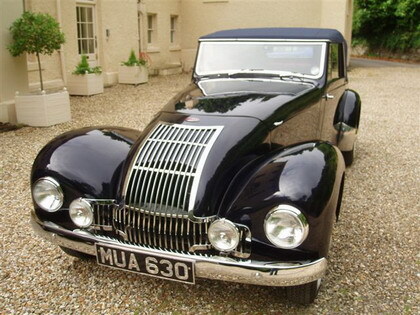 In the old days I had to search scrap yards, other Allard enthusiasts and suppliers for old stock. Nowadays, particularly with eBay and the internet in general, there is so much more available old and new. The flathead market in the 'States has spilled over here to a number of suppliers, it's great. I was never a computer fan but rebuilding the Allard has converted me into a computer nut. I completed the car at 2 am last Saturday (11th July) and Liz and I drove it over to the Allard gathering at Pickering later that morning (170 miles). I loved every minute of the drive there and back and the drive over the Yorkshire Dales with the other Allards to the steam railway station at Grosmont was wonderful. They've got the Atlantic Class steam engine the Sir Nigel Gresley working there, what a fantastic piece of good old fashioned solid engineering belching steam and smoke.